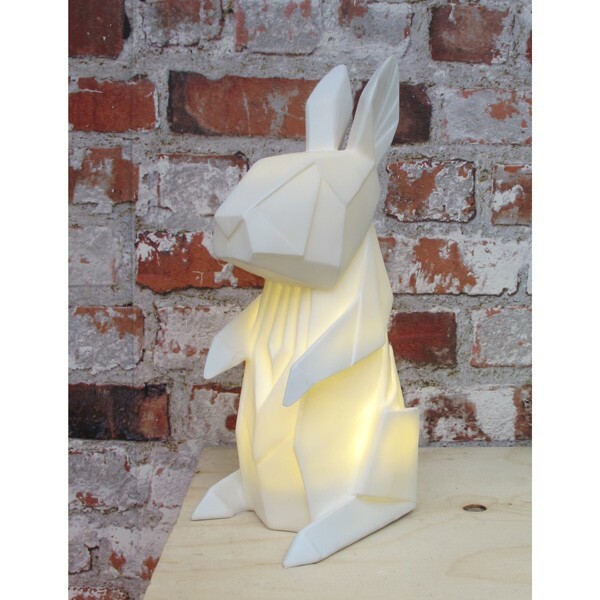 Add an adorable lighting feature to your home with the White Rabbit Lamp! This origami-style bunny table light from Disaster Designs’ Nordikka range would make a handy (and cute!!) addition to any bedroom or living room! This funky lamp features the pose of an inquisitive bunny sat up on its hind legs; but instead of its usual fluffy appearance, this cool critter has been given a designer edge with its origami-style folds and straight lines. Whether you love animals or simply adore quirky home accessories then you need this beautiful bunny in your life - go on, hop to it! This quirky animal lamp uses an LED bulb to emit a soft glow; making it a perfect night light for a child’s bedroom! It is mains operated and features a handy switch on the cable. It would also make a lovely gift for animal lovers and Alice in Wonderland fans, and it would also make a fantastic alternative Easter gift! See on the right hand side of the page for other funky origami-style lamps from Disaster Designs - including foxes, bears, dinosaurs and also this design in green! bought this for the new grandchild!